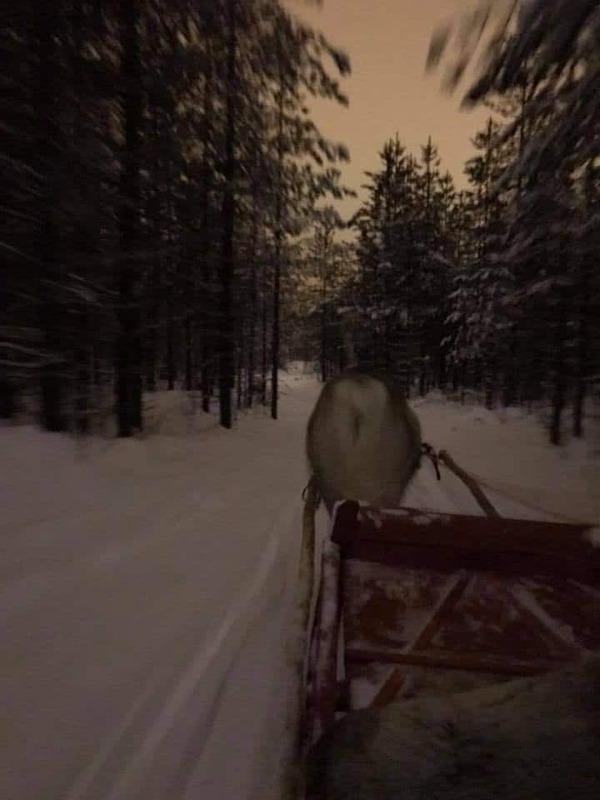 There are so many options for sleigh rides in the Lapland area. 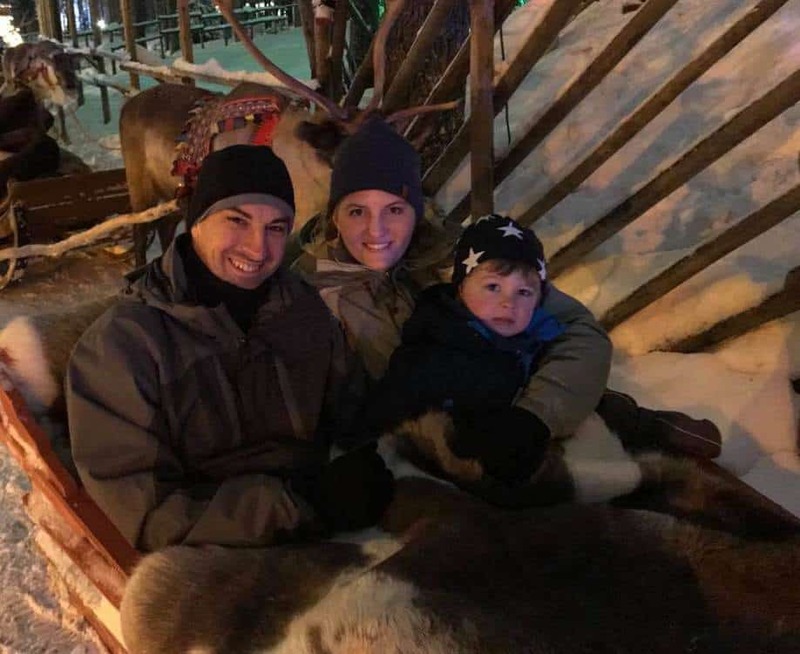 If you are staying away from the park, you can actually do a sleigh ride into the village and then back as a form of transportation. Since we were staying at the Santa Claus Holiday Village, the main post HERE, we decided to pick the company that was located directly in the park. 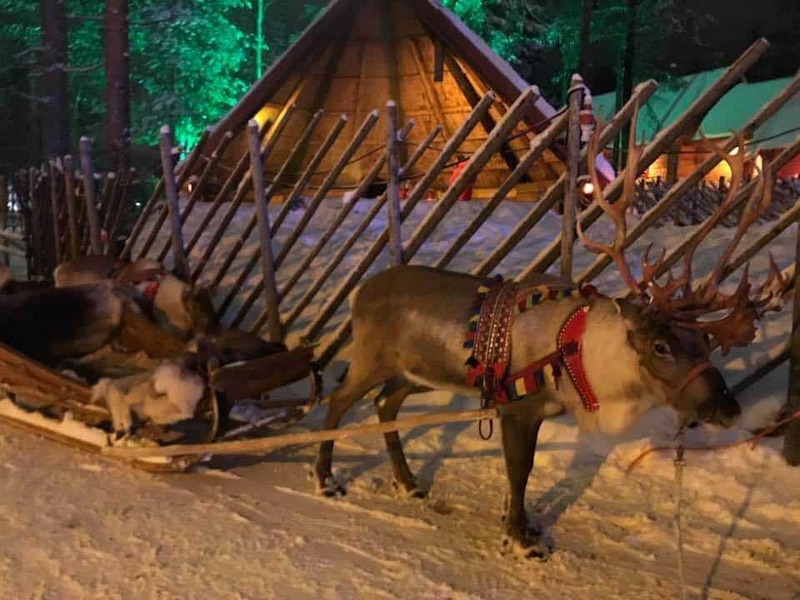 Click the image below if you want to read about our entire trip to the Santa Claus Village in Rovaniemi, Finland. You have three choices with Santa Claus Reindeer. If you choose the 400m (5 minutes) or 1,000m ride (15 minutes) at the Santa Claus Reindeer Park, you can just show up. However, it’s just a small loop around the track. Instead, we chose the 3,000m ride (35 minutes). It required a reservation, which worked out well because the line was really long for the two shorter rides. We checked in at the window, paid for our reservation and were pulled into a separate gate to get into our sleighs within a few minutes. If you have to wait for your ride, there is a nice open wood burning fire to keep cozy. Each sleigh had thick reindeer pelts to keep you nice and warm. Of course, still, bring your winter gear! The sleigh ride was really nice. They take you on a path into the finish forest. We ended up being in the first sleigh with the “driver” walking and riding alongside us. 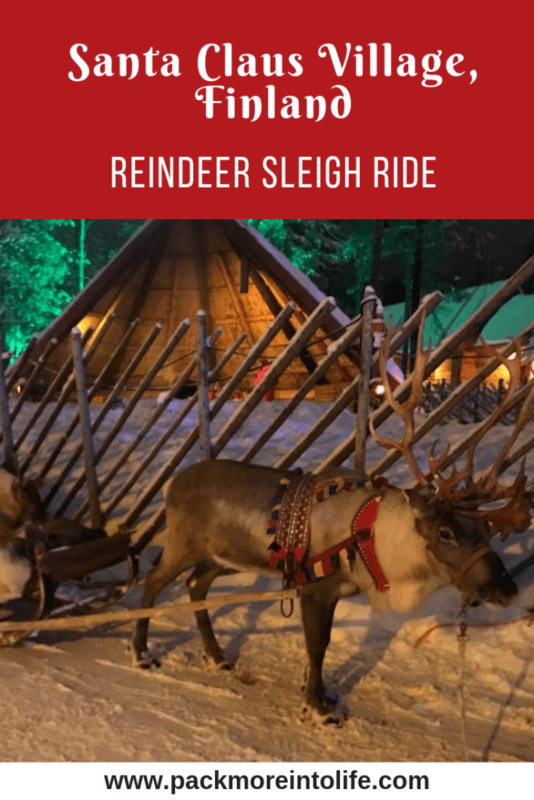 You are tied together with other sleighs, so there was another reindeer breathing in my ear, but all of the groups behind us were quiet and we all enjoyed a peaceful ride. After your ride, you can have a family photo taken and pet the reindeer. If you want to feed a reindeer, you’ll have to book a different tour since they don’t normally offer to feed with the rides. The starting times for 3 km in December are either at 9 am or 4 pm. Kids 3 and under are free. The 4 pm ride is usually much less busy than the 9 am sleigh ride. It looks like the company has updated the 3,000m ride according to their website. They’ve added a hot drink, guide and sausages to roast over the fire. Overall, we were happy with our sleigh ride experience. It didn’t require a long drive or a process of borrowing winter gear (like some of our other tours). We showed up early and had the first sleigh in the row. The ride was the perfect length at 35 minutes, which meant our 3 year old stayed nice and cozy snuggled in with his parents. I don’t think a longer ride would have been enjoyable and we would have bored of the same scenery. Looking for more activities? 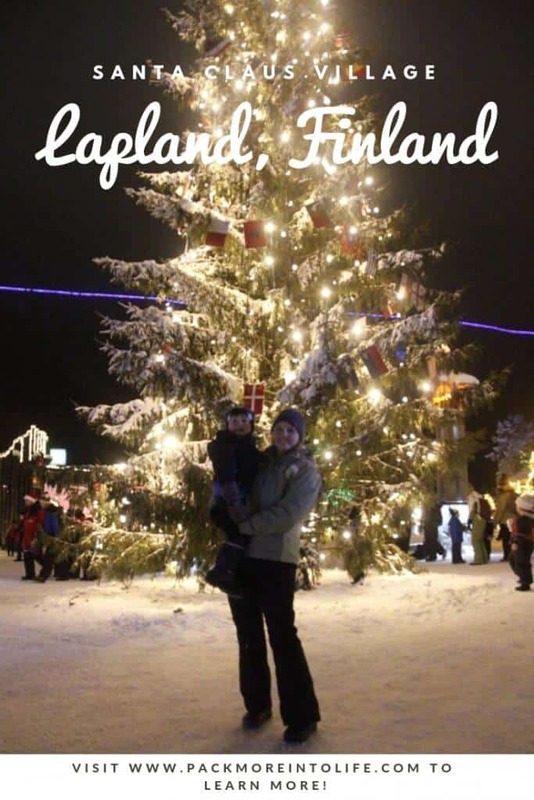 Head back to our Lapland Guide with Kids! Or if you want to explore more destinations that we’ve traveled to? Head back to our interactive map!